Whether you’re a DIY enthusiast or a seasoned professional tradesman, you can trust SGS Engineering to supply you with the highest quality jigsaw blades that provide the very best performance. We have blades ideal for cutting all types of woods, plastics, metal, non ferrous metal, aluminium and more. Milwaukee jigsaw blades are among the very best in the business. Regardless of whether you’re looking to cut aluminium, metal, plastic or wood, Milwaukee jigsaw blades are the perfect tool for the job at hand. Milwaukee’s fast cutting blades allow for clean and splinter free cutting of wood and plastics, providing the highest possible quality finish. Take a look at our full range of Milwaukee jigsaw blades to find the perfect blade for your application and jigsaw. 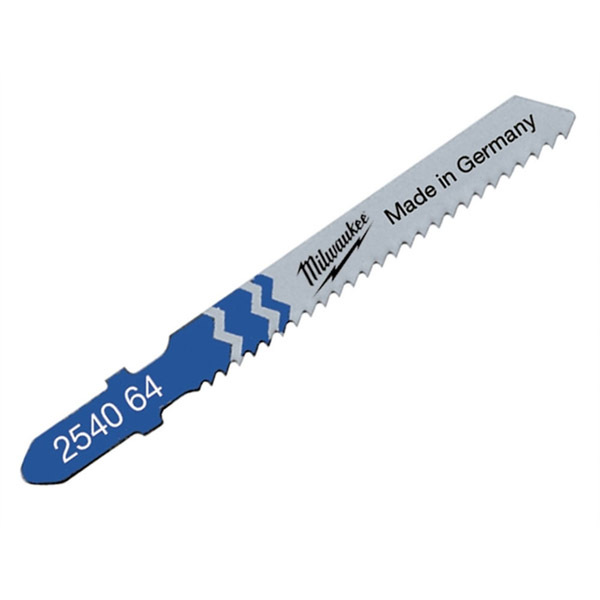 In our range of Milwaukee jigsaw blades, we’re proud to offer a wide selection of multipacks. From singular types of blade, such as a pack of five Milwaukee 4932254071 jigsaw blades, to mixed packs such as our Milwaukee 4932345825 jigsaw wood and metal blades set, you’re sure to find something to suit your application when you buy online with us. Plus you’re guaranteed to get a premium quality product at an affordable price. Why Buy Milwaukee Jigsaw Blades from SGS Engineering? As a UK manufacturer, our many years of trading experience make our knowledge of Milwaukee jigsaw blades, as well as all our other products, unrivalled. We can also guarantee the quality of the products you buy from us. We can give you great peace of mind thanks to our three-year extended warranty, which we offer free of charge. In addition, if you’re not happy, we offer a 60 day no quibble returns policy. Take a look at the full range of Milwaukee jigsaw blades online to find the perfect blades for your application.